Philips make quality men’s personal grooming products so it comes as a surprise that they do have a men’s shaver for those who are on a tight budget. The Philips Norelco Multigroom 3100 is so affordable at under $20 that you can buy an extra for travelling or the office. 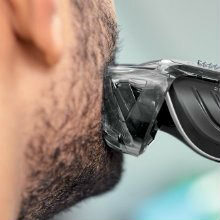 The Norelco line also consists of high-quality shavers, and this Multigroom Series 3100 will allow men to do a variety of shaving or trimming chores with only one shaver. And not only is this an inexpensive shaver, but it can also be used wet or dry, and it can also be used cordless. 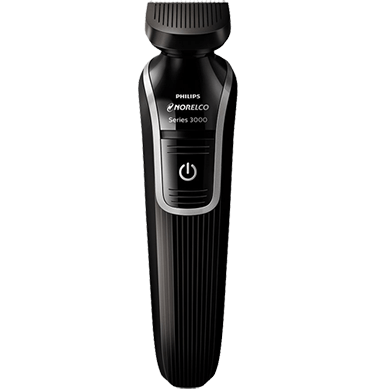 The Philips Norelco Multigroom 3100 looks like a cross between a men’s shaver and a men’s hair trimmer. It’s built with a rounded long black case with power button in the middle. The Philips Norelco Multigroom 3100 QG3330 comes with a variety of attachments. Together, there are five different attachments to help you to groom your hair. 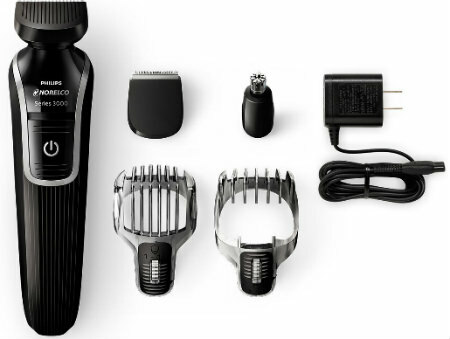 There is an attachable/detachable full size trimmer which is perfect for shaving around the edges of a beard, moustache, or sideburns to create perfect styling. There is also a precision detail trimmer to get into smaller spaces so you can create fine lines, contours, and details. 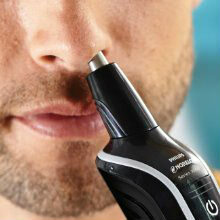 A nose trimmer will help get rid of pesky hairs that stick out from the nose. 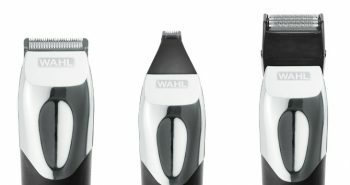 You can also use this trimmer to trim off hair that may be growing out of your ears. There are two comb attachments—beard and moustache—that can be used to trim beard or scalp hair, one for beard and moustache and one hair comb to do stubble or trim hair from 3mm up to 20 mm long. A nose trimmer will help get rid of pesky hairs that stick out from the nose. 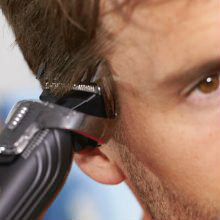 You can also use this trimmer to trim off hair that may be growing out of your ears. Once you have figured out your optimum shaving and trimming settings, be sure to note them down for next time round. You’ll be able to do incremental steps by 1 mm at a time. Together, with the different settings available on the Philips Multigroomer and the two different shaving combs, you’ll have the choice of up to eighteen different length settings. These different settings mean that you’ll be able to have your own personal shave so that you won’t look the same as any other man who may also own the same Philips shaver. You’ll be able to create any facial style you want, even styles that you have seen in film or magazines. Philips builds its shavers with great self-sharpening blades, and even though this is a cheaper shaver, men on a budget will still benefit from the great self-sharpening blades. However, don’t expect stainless steel blades in this shaver, these blades are made from chromium steel. They’ll still last a long time, and men with sensitive skin won’t have to worry about allergies, as these blades still do not contain nickel. 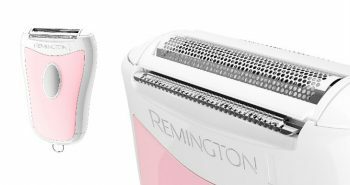 Each blade built within this shaver has rounded blade tips. 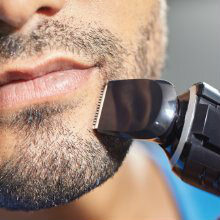 The attachable combs will also protect a man’s skin from irritation and cuts and scrapes. Hair tugging will also be minimized. The Philips Norelco Multigroom 3100 QG3330 is 100% waterproof. You can use it to have a great shave wet or dry. You can also rinse it under the tap to clean it easily. Even though the Philips Norelco Multigroom Series 3100 QG3330 comes at a low price, Philips has still built it with high performance in mind, as well as building it to last a long time, and making it easy to use. 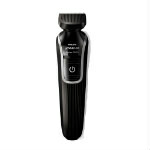 The Philips Norelco shaver comes with a power charger cord that can be used to charge it up. It takes about ten hours to fully charge up. This will give it up about thirty-five minutes of shaving time. 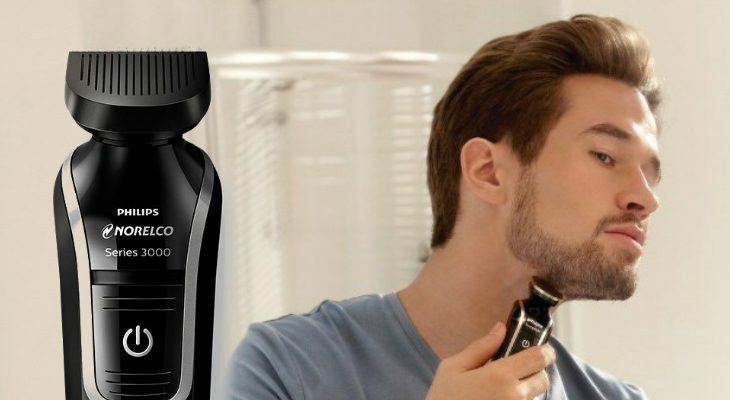 You’ll find that the pricier models of Philips men’s shavers will have much shorter charging times and longer cordless times, but if you’re on a strict budget, you could always keep your shaver plugged in until you need to use it for a cordless shave. But in the event that you do forget, you’ll still be able to leave the cord plugged it to use it for a corded shave too. This Philips shaver has an internal NiMH battery. The shaver is also great for travel. If you are only going away for a few days you can leave your charger cord at home, but if you need it for longer, you can flip a switch to make it adaptable to any worldwide voltage. It can be adjusted from 100 volts to 240 volts. There is also a power charging cord and a cleaning brush in the package. There is a Philips two year warranty on this shaver model so if you’re hesitating because the price seems too good to be true, don’t, as you’re still buying a quality shaver. There may also be an additional 45 day risk free trial on your purchase, depending on where you are purchasing your shaver from. This Philips shaver measures 2.4” x 5.9” x 9.7”. It weighs 11.2 ounces, or 12 ounces with everything in the box. This shaver has been made in Indonesia. Usually men’s shavers have ratings all over the place, as each man has different thicknesses and types of hair, but the Philips Norelco Multigroom 3100 has a great 4.3 out of 5 stars on Amazon, which is notable. This shaver also holds the number 8 out of 100 bestsellers’ rank on home and kitchen on Amazon, and number one in beauty, and number 2 in haircare. 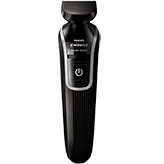 If you’re on a tight budget but need to purchase a men’s shaver or hair trimmer, the Philips Norelco Multigroom 3100 QG3330 is a great multi-purpose shaver. You can trust the Philips name and not worry when you buy this shaver. It also makes a great gift for the college or university student, and can also be purchased as a secondary shaver for travel, or for keeping at the office for those times when you need to look great for a meeting. I like philips norelco multigroom 3100. It has got lots of attachments and using this instrument, you can reach the hard to reach areas easily. Itâ€™s price is affordable and not heavy. From a shaving point of view, the Philips Norelco multigroom is one of the best shavers I’ve tried yet. Unfortunately, the non-replaceable NiMh batteries it uses lets the product down badly. I’ve had two of these so far and neither of them could hold a charge at all after a year.